Consistently digital – maximum efficiency with automation! Many companies today are able to integrate internal and external services into their complex production environments more efficiently than before. The potential for increasing efficiency in technical service through the automation of processes and the application of new industry 4.0 standards is high. Who doesn’t ask themselves afterwards on many occasions: Why did it have to be so complicated in the past? Anyone who installed a printer 25 years ago knows what this is all about. How has this improved since then? Both the standardization of the technology and its simple provision played an important role in this. What situation do we typically find today in complex production environments where there is a division of labor? Hardware and software work together perfectly wherever the actual production process is concerned. In the periphery – you are certainly thinking back to the printer now – there are many avoidable costs. Today, media breaks of the most varied kind exist when technical service is required. As a rule, a warning message is displayed today. An employee reads data from an already digital display and then records it manually in an IT system, often using paper as an intermediate information carrier. This works and it is flexible, but at the same time time-consuming. At this point, there is a lack of consistency right through to the external or internal service provider if these processes are to be made more efficient. If the operator wants to achieve this consistency, his first challenge is usually to determine which data the service provider should receive at all. Even manageable changes or extensions are often accompanied by IT projects, which can even delay or complicate the project itself. In addition, there is currently still a lack of standardization in the communication between machines. So there are still many hurdles in the processing of service-relevant data. At the same time, both the sensors and the available analysis methods are improving at high speed. Today, it is mainly the trained human eye that is required in production to interpret a situation correctly and to avoid unjustified technician deployments. The improved sensor technology and the use of adaptive procedures or artificial intelligence, however, lead us to expect that in considerably more cases than before, a necessary technician deployment for maintenance or repair work can be automated and reliably determined. Today, a high degree of automation can already be achieved in the processing of service orders. The eFLEXS Service Management solution, for example, allows service orders to be created automatically from the networked data of the plant or machine, service contracts, customer data and service products, and to provide these with the appropriate work schedule. The activities and technician assignments from these individual work schedules can also be automatically routed to specific work groups according to attributes such as location, required skills, urgency. The processing of these service assignments can be carried out according to different procedures: Technicians assign activities on their mobile device from the order pool of the working group themselves or a dispatcher fulfills this assignment and coordination. Here, too, the eFLEXS Optimizer can be used for automatic scheduling according to several criteria simultaneously, such as spare parts availability, urgency or the shortest routes and travel times. eFLEXS participates in DIN SPEC 92222 “Reference Model for Industrial Cloud Federation” with its Use Case of the “eFLEXS Service Registry”. Its main objective is to ensure interoperability and communication between participating IT subsystems and physical devices in the industrial 4.0 environment. The focus is on the necessary standardization to ensure interoperability and a recommendation of suitable technologies (www.din.de/go/din-spec-92222). At the same time, eFLEXS ensures the practical applicability of its eFLEXS Service Registry by participating in the LNI4.0 “Cloud Federation” testbed. 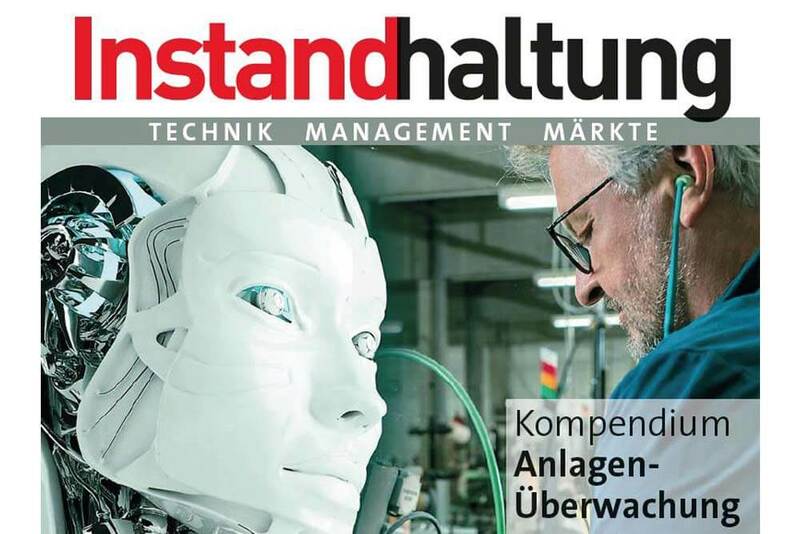 This testbed at the Kompetenzzentrum Mittelstand 4.0 in Augsburg opens up the practical implementation of concrete use cases for companies and SMEs without organizational obstacles. With its Service Registry, eFLEXS now offers an opportunity to close this automation gap. The digital service provider integration thus appears to be an orchestration of technical services of all kinds provided by internal and external service providers. 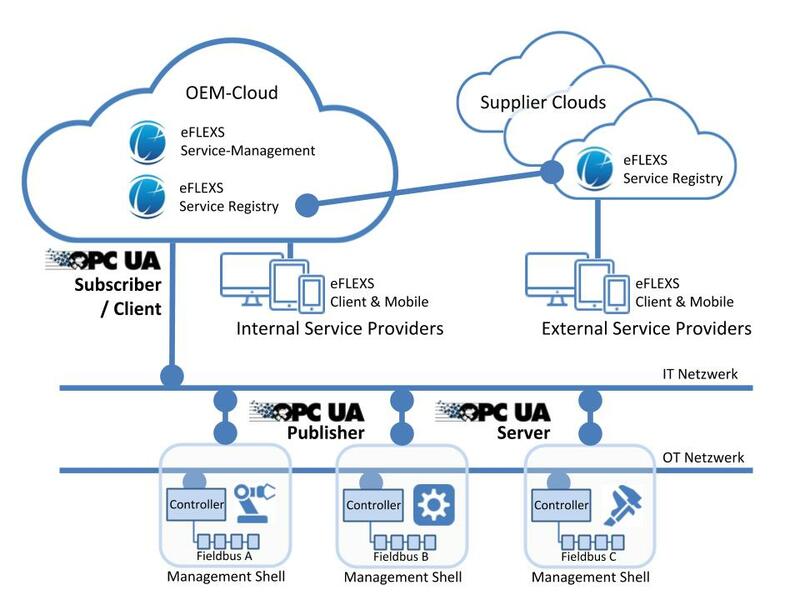 On the side of the emergence of service requirements, the eFLEXS Service Registry relies on standards that have already established themselves: OPC UA for monitoring operating characteristics, whether through cyclic polling or through the publish/subscribe mechanism in the OPC UA standard. In addition, the eFLEXS Service Registry is based on the “OPC UA Companion Specification for Devices”. Any controller that supports this standard on its own or via appropriate edge components can be configured directly in the eFLEXS Service Registry. In conjunction with the Companion Specification, OPC UA is much more than just a communication protocol. It also offers a semantic standard that can significantly reduce the effort required to integrate new machines and systems. The operator of the plant and machine can now configure – generally and on the basis of the OPC UA standards – which service-relevant events are to be processed. These lead on the one hand to incidents and on the other hand to active service requests that can be documented and tracked. In particular, it is up to the plant operator to decide which data is to be transmitted to the machine with the event. The plant operator also determines whether an event should be handled at all or not temporarily suppressed for operational reasons. OPC UA as standard enables a high degree of automation in the creation of technical service orders for the integration of internal and external service providers. The technical operator of a plant simply formulates his events, incidents, and requests. It is only at the higher service management level at the operator that a configuration of service catalogs takes place, which can now be published to internal or external service providers. For their part, the service providers have the option of configuring which parts of the service catalogs can be fulfilled exactly with which of their service products. On the basis of these service products and together with the data determined from the incident or request, the operator can now automatically create the service order in eFLEXS and, within a precisely defined degree of automation, also pass it on to his service providers within the framework of release procedures. An exchange of information with an ERP system existing at the plant operator exists at several points: On the one hand, service products or service catalogs can already exist as master data in the ERP system, from where they can be referenced, for example. In addition, the service order itself can be transferred to the ERP system, whether for different processing states or only at the technical completion of the service order, which is then further processed commercially in the ERP system. Depending on the ERP system, different processes can be implemented here. eFLEXS pursues the general goal of avoiding costly adjustments in the ERP system and providing a flexible platform for the diverse and usually variable and rapidly changing requirements in Technical Service Management. The eFLEXS Service Registry thus opens up a potential for increasing efficiency in technical service by closing the “automation gap” between the increasingly meaningful and reliable sensor technology and data analysis and the already largely automated management in technical service on the basis of existing standards – even across clouds and company boundaries. Get a personalized demo of eFLEXS to discover how you can benefit from the advantages of automation and how they can add value to your business.